Someone sent me this post on a simple mechanical bus advertisement in Norway. It's not the most interesting thing in the world, but what I found through a link in the post caught my attention. 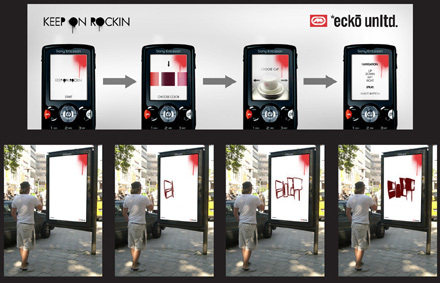 Apparently back in 2007, Marc Ecko had a hand in designing a bus shelter advertisement that allowed you to "spray paint" whatever you like on an LCD screen using your bluetooth phone. As much as I hate the use of this technology as an advertisement, as a public art work it is fantastic. Although the marks you make with your phone are not permanent, the act of creating ephemeral content in public space is still at the heart of what you're doing, and should provide similar emotions to actually writing on the walls of our shared spaces (without the fear). In fact, something as banal as this could even be a spark which motivates people who would otherwise not think of themselves illegally writing on public space, to actually go out and do so. It's almost a legal tutorial on what it is like to see your ideas expressed in the public, and that's empowering. We've certainly seen mobile-activated bus stop ads before, but the cool factor on this one was just too impressive to overlook. Tryvann Winter Park, a ski resort that sits just 15 minutes away from downtown Oslo, was searching high and low for ways to better market itself to residents of the bustling Norweigian city. In order to do so, it turned to JCDecaux, who conjured up the brilliant idea you see to the right. Essentially, this advertisement packs a few internal fans and a bucketful of faux snow; whenever it starts snowing up at the ski resort, someone sends a text to the billboard and the flurries start to fly. This way, residents and workers in Oslo can easily see when conditions are good some 500 meters up. We're told that Tryvann "loved" the campaign and the resulting crowds that came, though there's no mention of whether it'll be implemented next season or elsewhere in the world. Sure, we've seen a plethora of interactive billboards before, but Mark Ecko's (credit to Benjamin Busse) latest eye-catcher could seriously make you miss your ride. This brilliantly designed ad sports an LCD that can be painted up by your Bluetooth cellphone, as it allows passers to use their mobile as a spray can to decorate the screen as they please. No word on whether this thing accepts multiple connections or not, but a tagging duel would be mighty fine entertainment whilst waiting on the next bus.